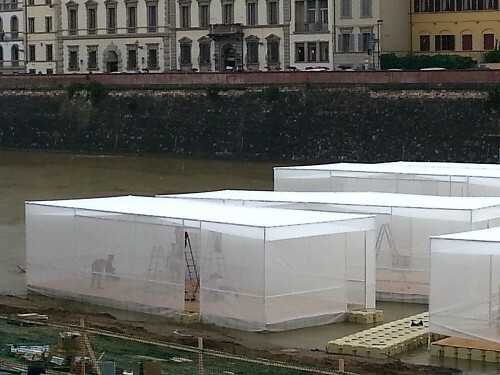 The Arno River has been making headlines and it’s about to do it again with the floating “Bridge of Love,” a conceptional installation by Architect Claudio Nardi. An extraordinary event for Florence. It is here in the home of the Renaissance that fashion, art and design meld together from the 13 – 17 of June for hope and peace, using the Pitti Uomo 2016, the world’s most important fair for men’s clothing and accessories, and Firenze4Ever as the backdrop. Coinciding with the 50th anniversary of the 1966 flood in Florence, the exhibition takes the very same river, whose uncontrollable power caused so much destruction, and reverses its role to symbolize hope in difficult situations and to raise public awareness for the refugee crisis. It is the first time ever the river will be used as an exhibition space! In this case, the Arno river is not only a stage but a message: water, though destructive, as we saw with the episode on the 25th of May and the collapsing of Lungarno Torrigiani, is also cleansing and offers a dream for new beginnings. 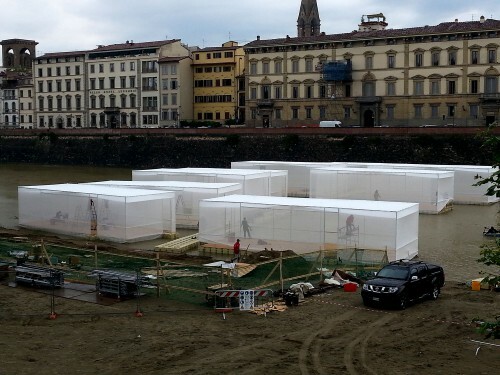 The 9 floating cubes connected by suspended bridges, will be wrapped in tulle and illuminated with lights reflecting in the cappuccino colored waters of the Arno River creating a magical atmosphere. The grand opening starts with LuisaviaRoma and a private Dinner Gala on the 13th, to raise not only awareness but funds for the UN Refugee Agency and in particular, “Lifeline Jordan”. The space will host special projects and presentations from 14-17 June. The inauguration to the public is on the 14th of June, and indications are that it will be open to the public from 6pm – 10pm. The bridge, set up on the beach of Easy Living in the shade of the Torre di San Nicolò, and underneath Piazzale Michelangelo, is visible from the bridge Ponte alle Grazie and along both sides of the river (Lungarno Serristori, alle Grazie and della Zecca Vecchia). So as you are wandering around the streets of Florence, stroll out to the Arno River and watch as Florence hosts this gesture of “speranza” (hope).